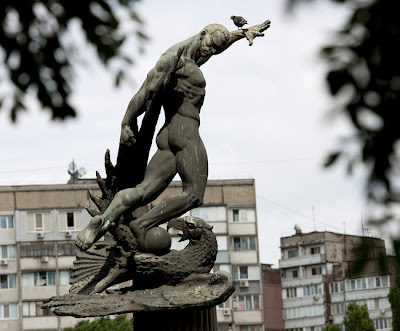 KIEV, Ukraine -- There are few striking features about Start Stadium except its disrepair. Wooden planks in the grandstand, like neglected teeth, are mostly loose or missing. A monument honoring F.C. Start players who faced a Nazi team in Kiev nearly 70 years ago. Behind the tiny seating area, though, a sturdy column rises and supports a statue. It depicts a muscular, naked man heroically kicking a soccer ball into the beak of a trampled eagle. Seventy years ago, on Aug. 9, 1942, the stadium became the site of one of soccer’s most infamous and disputed games, the so-called Death Match. With Kiev under Nazi occupation during World War II, a group of Ukrainian players defeated a military team of Germans thought to be from artillery and perhaps Luftwaffe units. According to legend, the Germans warned the local team beforehand or at halftime that it had better lose the match, and when the Ukrainians ignored the threat and prevailed, key members of the team were killed in retribution. The final score was 5-3. That much seems widely agreed upon. And four or five Ukrainian players did die within six months of the game, according to various accounts. Were they killed because they won a soccer match? All the participants are believed to be dead. The truth remains elusive. One player who popularized the legend seemed to tell as many versions of the story as there were goals in the match, both burnishing the myth and betraying it. That long-ago game is gaining renewed attention as Ukraine serves as a co-host for Euro 2012. The match has grown far beyond a sporting contest into myth and folklore, immortalized in landmarks around Kiev and in articles, books, documentaries and movies, even a version featuring Sylvester Stallone. The latest film, called “Match” and made by Russians, was released before Euro 2012 and raised an outcry for portraying Ukrainians as Nazi sympathizers. Some believe the 1942 game was, or could have been, a death match. Many academics and journalists dismiss the legend as Soviet-era propaganda and have sought to refute it. Still others seem unconcerned with the truth. They embrace the myth as an enduring symbol of Ukrainian patriotism and defiance in a country where 8 million to 10 million citizens died during the war, a country where starvation diets included tree bark and cow dung, a country whose national World War II museum displays a machine used by the Nazis to grind human bones into fertilizer. “The facts say the match took place, but there was no death match as such,” said Marina Shevchenko, a historian who works at Kiev’s National Museum of the History of the Great Patriotic War, as World War II is known in the former Soviet Union. On Sept. 19, 1941, the Nazis occupied Kiev. Days later, more than 33,000 Jews were killed at Babi Yar, a ravine on the outskirts of the battered capital. In a footnote to the German invasion of the Soviet Union, the Ukrainian soccer season was abandoned. But by June 1942, a kind of soccer tournament was apparently organized, featuring two Ukrainian teams and garrisons representing Germany, Hungary and Romania. The best team, F.C. Start, went undefeated. It was composed of Ukrainian bakery workers, most of whom had played or were to play for the powerful Kiev club Dynamo, which would later win 13 Soviet league championships. As the story goes, the owner of the bakery, also described as a bread factory, had been a big fan of Dynamo. He came up with the idea of forming an amateur team, providing extra food rations to the players and time to train. On Aug. 6, 1942, Start is said to have routed a German Flakelf team by 5-1. Flakelf translates to Flak 11, suggesting the German team was composed mainly of those who manned antiaircraft guns around Kiev. A rematch against a reinforced German team was held in late afternoon three days later. A copy of a poster announcing the Aug. 9 game is displayed at the World War II museum. An estimated 2,000 spectators, paying five rubles apiece, were said to have attended the rematch at Start Stadium, then known as Zenit Stadium. By some accounts, the stadium was ringed with soldiers, SS officers and police dogs, though others discount this. Makar Honcharenko, a star wing for Start, said in a 1985 oral history that some unnamed people warned it could be risky playing against and defeating the Germans in a rematch. “Everyone told us: ‘What are you doing? It’s a real danger,’ ” Honcharenko said in the oral history, taped by the staff of the World War II museum, which also translated that interview from the Russian for this article. The Start players listened, but ultimately decided to proceed with the match. He also said that a Gestapo officer visited the team before the match, introduced himself as the referee and told the players they should raise their right arms and make the Nazi salute on the field in a pregame greeting. The players agreed without intending to comply, Honcharenko said. According to this 1985 account, the game began roughly and the Start goalkeeper, Nikolai Trusevich, was knocked out. Water was poured on the goalkeeper to revive him, but while he was still dazed, the Germans scored three goals. Trailing at halftime, the Start team decided to play for a tie, believing the referee would never allow the Ukrainians to win. And after the match was tied at 3-3, Honcharenko said he scored the final two goals to give Start a 5-3 victory. In a 1992 interview with a Kiev radio station, Honcharenko gave another version of the match, which is the most romanticized account. In this version, Start drew inspiration from its goalkeeper being kicked in the head and made woozy, taking a 3-1 lead by halftime. This is when an SS officer entered the locker room and complimented the skill of the Start players. But, in a tone both polite and resolute, the officer also said they should consider the consequences of victory, suggesting they throw the match to the Flakelf team. The Germans must have by then regretted the rematch, Dougan said. “It did turn out to be a nightmare because they had given the local people something to rally around,” Dougan said. Yet Start apparently did not succumb. One eyewitness account in Dougan’s book said that a Ukrainian player, Alexei Klimenko, dribbled through the Germans near the end, then kicked the ball upfield rather than scoring in a final act of humiliating the occupiers. The most extreme myth says that the Start players were shot immediately after the match, lined up and killed on the field or put against a wall. This is clearly not true. Honcharenko said in 1985 that the Start players were “a little nervous,” but showered and went home. According to a widely disseminated photograph, players from both teams stood together for a postgame snapshot, some of them smiling. Although, as with much of this tale, even the photograph is in dispute; some believe it was taken just before the match or at another game a month earlier. It is also not true that the Start players escaped en masse, as portrayed in the 1981 movie “Victory,” reset in Germany and France with Allied prisoners of war and starring Stallone, Michael Caine, Pelé and a collection of professional players. What actually happened after the match remains as murky in many aspects as what happened during it. By many accounts, F.C. Start played again on Aug. 16, trouncing another Ukrainian team, Rukh, 8-0. But in his 1985 oral history, Honcharenko said the Start players were arrested by the Gestapo at the bakery where they worked on Aug. 10, the day after the rematch with the Flakelf team. Gestapo agents carried a poster or flier with names of other players from Dynamo — the pre-occupation team for many Start players — and wanted to know where they were, Honcharenko said. He did not elaborate, but Dynamo was sponsored by the police. Perhaps the Gestapo suspected players of being members of the N.K.V.D., the police and state security precursor to the K.G.B. The players were separated and tortured for more than three weeks, Honcharenko said, before being taken to the Syrets concentration camp on the edge of Kiev, near the Babi Yar ravine. Other accounts have the Start players being arrested on Aug. 18, shortly after the match with Rukh. They may have irritated a new occupation regime in Kiev and undermined the idea of German superiority by winning all their matches. They may have been betrayed by Georgi Shvetsov, the player-manager of Rukh, who was said by some to be jealous of Start’s success. They may have been suspected at the bakery of putting ground glass into bread to be eaten by Germans. They may have been suspected of ties to the N.K.V.D. One player, Mykola Korotkikh, is reported to have been killed several weeks after the match on suspicion of serving in Stalin’s internal security force. Some accounts say that a photograph was found of him in an N.K.V.D. uniform and that he was turned in under duress by his sister. Six and a half months after the match, on Feb. 24, 1943, three Start players were reportedly shot to death: Trusevich, Klimenko and Ivan Kuzmenko. On Feb. 23, a Kiev plant where the Germans repaired motorized sleighs was said to have been sabotaged in an arson attack by partisans. Around that time, a work brigade from the Syrets camp was also said to have been caught trying to smuggle in sausage; one of the workers may have tried to attack the camp commander or his German shepherd upon being caught. In retaliation, the Germans are reported to have shot one of every three prisoners in the work brigade. Dougan, the Scottish author, said he believed the Start players were killed deliberately. “It may well have been sheer chance, but these were not just three players, but three very good players,” he said. Prosecutors in Hamburg, Germany, investigated the episode. But they closed the case in 2005, saying they found a lack of any evidence that the Start players were purposely killed for defeating the Flakelf team on that late afternoon in 1942. That has hardly kept fact from becoming embroidered with legend. By late 1943 and early 1944, once Kiev was liberated by the Soviets, newspaper articles began appearing, describing details that would fit into a jigsaw myth known as the Death Match. Initially, Soviet authorities were hesitant to promote the legend, concerned that the players might have been Nazi collaborators for participating in that series of games in 1942, according to Tetiana Bykova, a historian at the Ukrainian Academy of Sciences who has studied the so-called Death Match. But articles had been published and “the genie was out of the bottle,” Bykova said. The Soviet solution was to pretend the other matches had not taken place and to embellish the idea of a death match, Bykova said. Beginning in the late 1950s, with publication of a Kiev newspaper article and book called “The Final Duel,” and subsequent movies released in the Soviet Union and Hungary, the match came to serve both as a source of Ukrainian pride and useful Soviet propaganda. “It’s like in ‘The Man Who Shot Liberty Valance,’ ” Dougan said. Initially, the Start players had been reluctant to discuss the match. A key reason was fear, Dougan and others said. Fear of being seen as Nazi collaborators. Fear of being resented for living under less harsh circumstances than others and for shirking their war duty. Fear of contradicting a tale of Soviet heroism amid Nazi atrocities. This helps explain why Honcharenko gave conflicting versions through the years. As the Soviet Union collapsed, more prosaic accounts of the match were given. Georgi Kuzmin, a Ukrainian journalist who has covered soccer for more than 40 years, said that Honcharenko told him in 1991 that no one asked the Start players to throw the match and that Honcharenko did not believe the players were deliberately killed for winning. Honcharenko gave a similar account of an ordinary match to a Ukrainian newspaper in 1996. When the former Start players were awarded medals some two decades after the match, one of them, Mikhail Putistin, declined his, saying later he could not participate in a lie, Kuzmin said. Bykova, the historian, said evidence indicates the Germans played fairly and did not injure the Start goalkeeper, at least not on purpose. It was the Ukrainian players who became the more aggressive team as the match progressed, she said. She also believes a straightforward recounting of the game might have become even more powerful than the myth. “It takes more perseverance and courage to survive on a daily basis, to come home and see the hungry eyes of your children, than to pull yourself together for two hours for a game,” Bykova said. Today, Start Stadium hosts summer matches by amateur and semiprofessional teams, whose players do not always wait until the final whistle to fortify their fitness with beer and cigarettes. Children ride bikes and roller-blade on an asphalt track around the well-kept field. And the statue behind the crumbling grandstand helps perpetuate the legend of the Death Match. “It was propaganda,” said Kuzmin, whose history of Ukrainian soccer, “What Did and Didn’t Happen,” was published in 2010. For some, truth is beside the point. At the Dynamo stadium in Kiev, there is a monument honoring the four Start players who died in the weeks and months after that 1942 match. The players are shirtless, holding hands, boldly resistant. Tours of the stadium and the monument are not burdened by debate. They are celebrations, not investigations. “Not one document can prove any of these things,” said Kirill Boyko, the manager of the Dynamo fan club.